Digital technology is progressing fast, disrupting the business and policy-makers and consumers while improving safety and lowering costs. This was among the messages from a conference organised by the Financial Times in September. The opening keynote featured the International Energy Agency’s (IEA) chief economist Laszlo Varro, who addressed the role of digital technologies and their impact on cities, transport and renewable energy. Varro said there is real technological progress in electricity generation and variable renewable energy. This is addressed in a recent IEA report. Solar is now becoming the cheapest power source – nothing beats it. There is a need to connect all downstream assets and make them smart in order to get the best out of them (Figure 1). The new world is based on customer choice and networks linking renewable energy into the energy system. Key also is the electrification of the home, which is moving from being a hardware problem into being a software problem. The IEA believes that equipping power grids, producers and consumers with intelligent devices, connected in what is often known as the “industrial internet of things” and managed using artificial intelligence, could enable renewable energy and make a huge difference to electricity supplies. 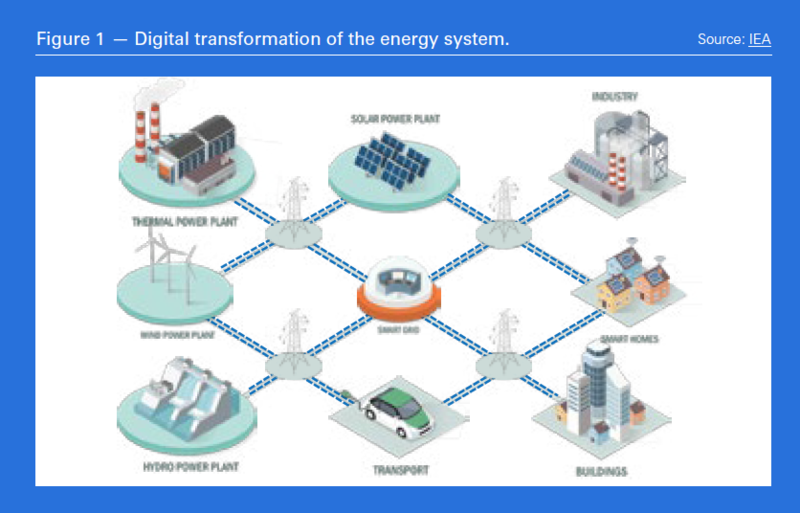 The IEA also believes that “digitally interconnected systems could fundamentally transform electricity markets.” The greatest transformational potential for digitalisation is its ability to break down boundaries between energy sectors. Four examples of key areas that provide such opportunities are: smart demand response; integration of renewables; smart charging for EVs; and development of distributed energy resources. Smart demand response allows appliances and equipment to be monitored continuously to enable demand to be matched optimally with available supply, but without affecting the comfort of the consumer. Most potential applications and benefits are in the buildings sector, especially in space and water heating and cooling, but also in the deployment of EVs and smart charging systems. The IEA estimates that as much as a fifth of global electricity demand may be available for demand response, with potentially significant savings. Better integration of renewables through digitally enabled response and storage can help introduce flexibility and reduce curtailment when renewable supply exceeds demand. The IEA estimates that in Europe such measures, enabling grids to better match energy demand, can help reduce curtailment from 7% to 1.6% in 2040. Smart charging EV infrastructure can be optimised to reduce peak demand by shifting EV charging to times when demand is low. New systems, still being developed, would allow EVs to be used as ‘batteries on wheels’ that can both withdraw electricity from, and inject electricity into, the grid, thus being able to sell balancing services to the grid operator. Distributed energy generation allows consumers to have the choice to buy electricity from a retailer or to produce at least part of it themselves, becoming ‘prosumers’. Digitalisation can then facilitate better use of larger shares of distributed energy resources, such as household solar pv combined with battery storage as variations in energy consumption can help households to balance each other out, meaning less redundancy. Such smart microgrids can provide a steady power supply and are capable of sustaining themselves indefinitely and independently of large, centralised grids. This also means power can be maintained even when parts of the grid fail. But large centralised grids can also benefit. The German TSO says that with renewables becoming the dominant player, once they exceed 40% of electricity, new market products closer to real-time, new business models and innovative technologies are needed. TSOs have to master this dynamic change process fast and without major incidents. Digitalisation has led to higher efficiency in operations throughout the energy supply chain, through the use of better analytics, the introduction of automation and artificial intelligence (AI), and the use of quantum computing technologies. According to the IEA’s report, “Rapid analysis of data can lead to faster decisions and increase the operating time of drilling rigs, wells and facilities, thereby reducing delays when executing new projects. This is leading to lower costs and the more efficient use of capital.” Digitalisation of tight oil and shale gas production by combining AI with sensors and sophisticated data management tools is allowing companies to operate and maximise production more efficiently, requiring only a small number of engineers and technicians. The use of more sophisticated processing algorithms could also assist with the finding of new oil and gas fields, the generation of development plans, and the ranking of exploration portfolio options for upstream operators. 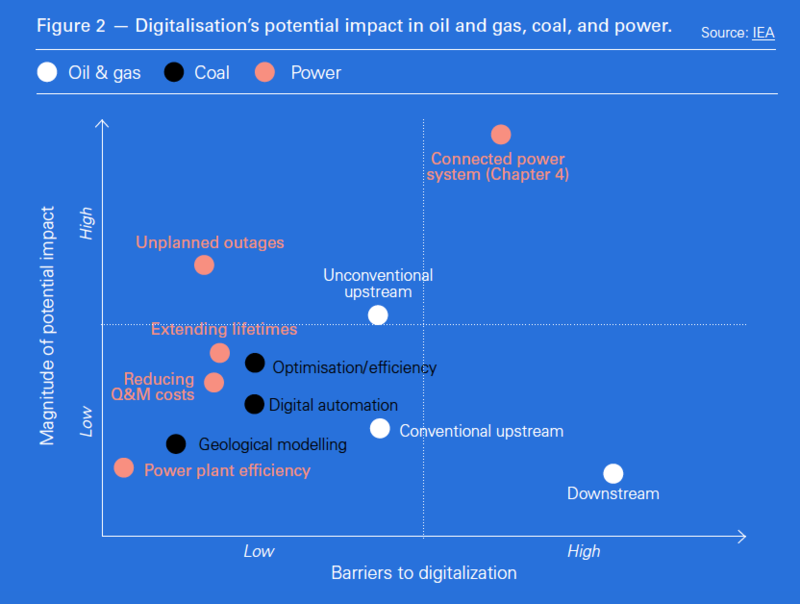 Digitalisation has progressed at a massive scale in the US and Europe unlocking resources, bringing huge advances in the flexible use of energy, with huge potential impact on energy sectors such as oil, gas, coal and power (Figure 2). An example is Eni’s digital transformation based on skills. Through the launch of its new HPC4 supercomputer, Eni now has the world’s most powerful computing system in the industrial sector. This is already leading to significant economic and operational benefits, extending to health, safety and environmental impact; to reliability of plant; and even to the development of new business models and the acceleration of decision-making processes. All of these are becoming increasingly data-driven. But where astonishing benefits have been derived is in the analysis and interpretation of vast amounts of data from 3-D seismic surveys to identify new oil and gas reservoirs. This digital capability has helped ENI achieve extraordinary results, such as the discovery of the Zohr gas-field in Egypt, the largest ever made in the Mediterranean. China is investing heavily in renewables and the transmission network to connect generation to demand centres. The IEA is working with China on energy transition and security, capacity building, data and statistics, grid integration of variable renewables, energy efficiency and technology innovation, focusing especially on energy markets and policies. There are still problems in fully unlocking the triangle of business, IT technological progress and regulation/policy. Regulation tends to lag behind business and IT technological progress and can be restrictive, often holding progress back. This can be addressed by building flexibility into policies to accommodate new technologies and developments. Darryl Willis, vice president oil, gas and energy sector, Google Cloud, addressed applications of AI in the energy sector. He said that Google is aggressively developing AI products working together with companies in the energy, oil and gas sectors, working closely with Total, Schlumberger, Equinor and Repsol. An important part of this work involves transformation of analysis and interpretation of 3-D seismic data. Advancements in subsurface AI applications are accelerating identification and recognitions of geological features and reservoirs. There are also major developments in preventative maintenance. To unlock this potential, in addition to gathering high-quality data from their wells, rigs and operations, companies are benefiting through the use of advanced analytics and AI tools. Any company that has data can leverage AI to improve performance. Machine learning, data analytics and AI thrive on lots of data, but most companies use only 5% of their data – there is huge potential for improvement. Those who do will be the winners and those who do not may end up being the losers. Newcomers may overtake those who do not, as technological and economic disruption continues. Yves Le Stunff, E&P digital officer Total, talked about the company’s collaboration with Google Cloud in the development of AI solutions for geosciences. The aim is to use machine learning to automatically analyse images and compensate for the manual interpretation that can take several months. Google’s competitors Amazon and Microsoft are also busy developing cloud-based AI technology. Shell is also undergoing digital transformation by investing in an AI platform, C3 IOT, in combination with Microsoft Azure to support predictive maintenance operations, production optimisation and fraud detection across the company. The benefits will be realized by rapidly scaling and replicating AI and machine learning applications across Shell’s upstream, downstream and unconventional businesses. It is estimated that more than 600,000 assets, from individual pieces of equipment to entire wells, will be covered by the predictive maintenance programme. Shell expects that such benefits will run into billions of dollars per year. However, despite this progress Deloitte points out that AI, robotics and automation are still rated relatively low by much of the energy industry. Shell agrees that oil and gas is behind other industries, partly constrained by a shortage of qualified people, but it is catching up fast. 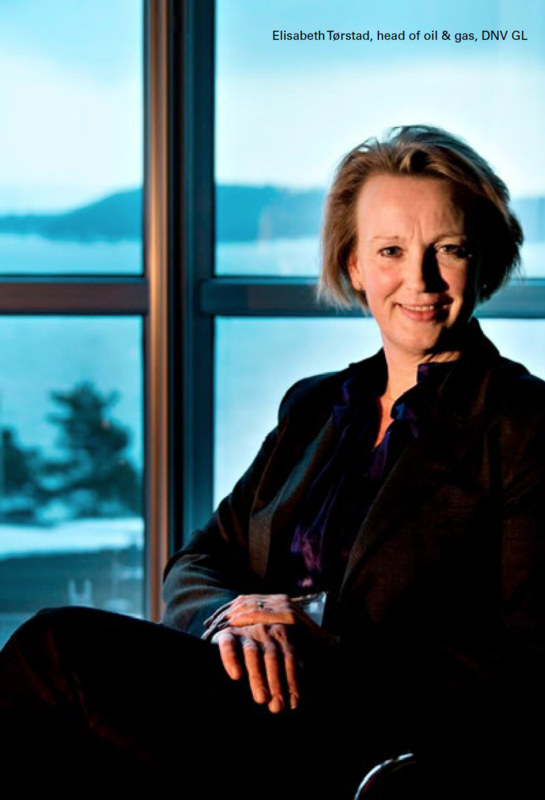 The head of DNV GL’s Digital Solutions Division Elisabeth Torstad made the point that digitalisation both enables the energy transition and is essential for survival in volatile energy markets. According to DNV GL’s Energy Transition Outlook 2018, released in September, primary energy supply will peak in 2032, driven mostly by efficiency gains growing at a faster rate than global GDP. These gains are largely linked to electrification, the explosive growth of renewables, and accelerating efficiencies in the energy value chain from source to end-use. Transportation is expected to see a rapid uptake of electric vehicles (EVs) once cost-parity with combustion engine cars is reached within six years. On top of this, electrification of heavy vehicles is getting closer. With increasing urbanization energy and electricity demand is also increasing, as is the need for efficiency gains by switching to gas and electricity. Most of these are linked to digitalisation. The energy system is becoming more complex, both globally and locally. Energy sources like natural gas and renewables need to work together. Global economic growth and energy use are no longer linked. Electrification is expected to more than double from 19% now to 45% by 2050, requiring flexibility measures, such as demand response and energy storage. Solar and wind are taking over because of their relatively low cost, and not only because of the need to cut emissions. But these will not be enough to meet the targets of the Paris Agreement. According to DNV GL, this is where policy can provide further support. Policymakers will need to make far-reaching decisions to accelerate energy transition, possibly through measures that lead to restructuring markets by influencing consumer and investor behavior, but without increasing investment risk. Digitalisation is a key enabler in driving energy transition and intensifying it as an integrated part of the energy system. It makes energy systems more intelligent, reliable and efficient by improving planning, maintenance, safety and sustainability, leading to lower costs in the energy sector. It allows utilities to deliver energy at the right time and in the right place. 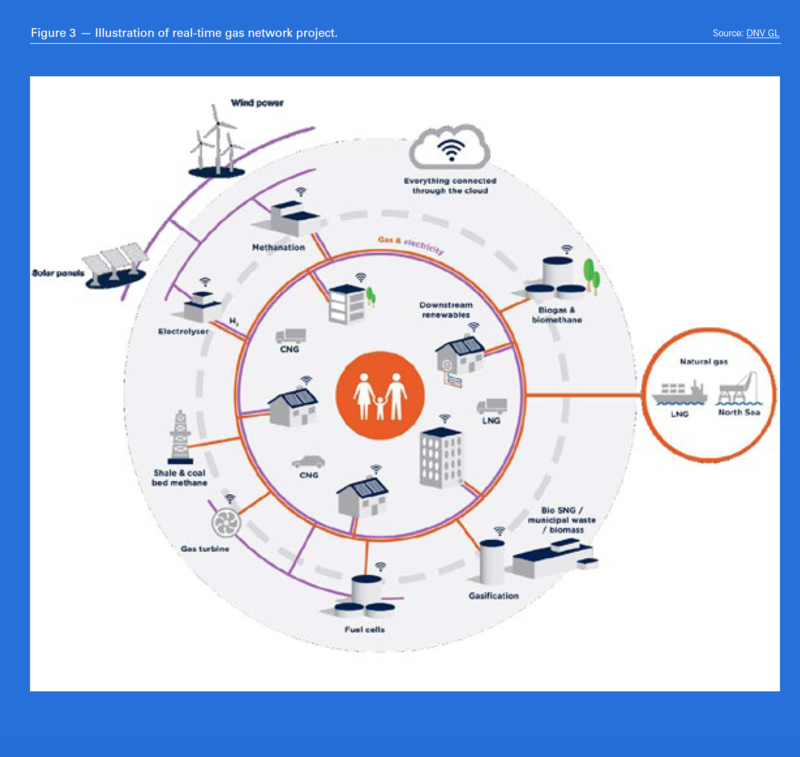 An example is the Real-Time Networks (RTN) project, developed by SGN, the UK’s second largest gas distribution network operator, in partnership with DNV GL. This aims to create a new modeling technique to accurately measure energy flows within the complete network (Figure 2). Digitalisation lowers costs of monitoring and control of energy generation from fossil fuels, nuclear, and renewables, helping realize efficiency gains and a lower level of losses, through remote monitoring of assets, allowing them to be operated closer to their optimal conditions. It also allows the better use of assets already in place through better controls. One such example is a project being carried out by DNV GL and Robert Gordon University (RGU) and supported by the Oil & Gas Innovation Centre (OGIC) in Aberdeen. DNV GL is developing a program to extract structural and processing information from images of piping and instrumentation diagrams and other engineering drawings and use it to create a 3-D digital twin of a platform. The aim is to employ AI to speed up processing of data and predict task durations, associated risk and non-productive time (NPT). This will lead to an automated system to manage the end-to-end compliance process with regulations and standards. Another example is Equinor’s teaming up with 4Subsea to provide subsea well condition monitoring services and sensors to support the company’s need for collecting, processing, documenting and digitalising measurement data for improved visualisation and decision-making. Rising complexity, combined with the prospect of an energy market becoming relatively smaller in the mid-2030s, makes the search for connected, intelligent, reliable and sustainable energy production and power systems that much more strategic and urgent. The keys to this are data quality and security, new digital technologies and learning algorithms, as well as trusted data sharing and management platforms. Morag Watson, vice-president of digital innovation, BP, said that the energy industry is experiencing an explosion of data, not all perhaps useful. And it is not easy to chuck out existing models in favour of new ideas. So AI scares traditional engineers, familiar with what works safely. The industry is also wary of sharing data with companies that could, at some future date, become direct competitors. and is becoming the essence of AI – it will be transformational. It is now possible to get much more out of data through faster analysis using smart tools. AI can assist in decision-making and helps to manage operational risks. Applications include helping locate and develop oil and gas reservoirs; enhancing oil and gas production and refining crude oil; and increasing process automation and operational efficiency. ABB released in August a new guide for oil and gas operators that shows how digitalisation can enable a more efficient future. An unmanned platform in the North Sea typically needed 909 hours – 38 days – of maintenance work each year. Following the introduction of its concept, on-site maintenance has been reduced by 97%, with 882 hours moved onshore. AI has helped BP improve its offshore reliability. Early results from outfitting wells with sensors and analysing the data over a six-month period at BP operations in the US, helped reduce methane emissions by nearly 75%, increase production by 20%, and reduce costs by 22%. BP also announced in September that it has deployed successfully a cloud-based advanced analytics system, Plant Operations Advisor (POA), on its four production platforms in the deep-water Gulf of Mexico. POA, developed with Baker Hughes GE, applies predictive analytics to real-time data from the production system and provides engineers with insights to anticipate and prevent problems. This stops unnecessarily frequent intervention and also reduces the risk of actual shut-downs owing to a problem going undetected by human error. Watson said that what makes AI so important now is the combination of sensors, computer power and algorithms. BP believes AI will be one of the most critical digital technologies to drive new levels of performance. But with it come risks and limitations such as data storage, data sovereignty and cyber-security that need to be addressed. While AI can bring many positive benefits, it can also make energy systems more vulnerable to cyber-attacks. But even though digital transformation is up and running in the oil and gas industry, some are asking why is it still so hard to sell. One answer is that ‘fixed mind-sets’ may be holding the industry back. Another is that when prices are volatile it is hard to implement change, especially digital transformation.